VATICAN CITY (CNS) — Selfishness only brings sadness and bitterness, while stepping outside of oneself to evangelize is the ultimate “pick me up” and source of joy, Pope Francis said. “Let’s live the Gospel with humility and courage. Give witness to the newness, hope and joy that the Lord brings to your life,” the pope said May 22 at his weekly general audience. Speaking to more than 80,000 people gathered in St. Peter’s Square, Pope Francis also called for prayers for those struck by a deadly tornado in Moore, Okla., which left at least 24 people dead, including at least eight children, as it destroyed numerous homes and leveled an elementary school May 20. “I invite all of you to pray with me for the victims, especially the children, of the disaster in Oklahoma,” he said. The pope made the call for prayers after leading his weekly general audience in which he continued a series of talks about the affirmations of faith in the creed. He focused on the role of the Holy Spirit in the “one, holy, catholic and apostolic” church. The Holy Spirit gives the church life and guides her steps, he said. The church exists to evangelize, which is the mission of all baptized Christians, not just a few, he said. However, it takes prayer and the Holy Spirit to truly evangelize, he said. Proclaiming the Gospel “must always start from prayer,” he said, since “only a faithful and intense relationship with God” lets people break out of their shell to share the Good News with others. “Without prayer, what we do becomes empty and our proclamation lacks soul, it isn’t enlivened by the Spirit,” the pope said. The Holy Spirit provides courage and unity, helping people proclaim the Gospel out loud and “with frankness” at every time and in all places. The Holy Spirit brings unity because it brings “a new language” — a language of love that everyone can understand and express in every culture and part of life. “The language of the Spirit, the Gospel and communion invites us to overcome being closed up, the indifference, divisions and polarization,” he said. Sometimes today it seems like it’s Babel all over again with divisions, the inability to understand each other, rivalries, jealousies and selfishness, the pope said. People have to ask themselves: “What am I doing with my life? Do I create unity around me or do I divide, divide and divide with gossip, criticism and jealousies?” he said. People should reflect on whether they bring, through their words and deeds, “the reconciliation and love” of the Gospel to every aspect of their lives. The pope asked people to never close themselves off to the action of the Holy Spirit and to receive his gifts of courage and strength to share the Gospel. It’s something every Christian should do “because evangelizing, proclaiming Jesus gives us joy while egoism gives us bitterness, sadness; it drags us down and evangelizing picks us up,” he said. He asked that people have faith the Holy Spirit is “acting within us, he is in us” giving people the apostolic zeal, peace and joy that are needed to bring God’s unity and communion to the world. 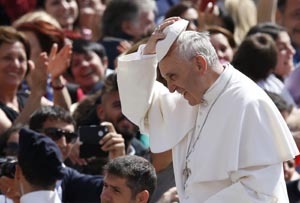 At the end of the audience, Pope Francis asked people to pray for the Catholics in China so that they may have grace to proclaim Christ with humility and joy, and be faithful to the church and the pope. The pope recalled the church’s May 24 celebration of feast of Our Lady, Help of Christians, which Pope Benedict XVI established as a world day of prayer for the church in China.